The long-awaited revision of Fundamentals of Applied Probability and Random Processes expands on the central components that made the first edition a classic. The title is based on the premise that engineers use probability as a modeling tool, and that probability can be applied to the solution of engineering problems. Engineers and students studying probability and random processes also need to analyze data, and thus need some knowledge of statistics. This book is designed to provide students with a thorough grounding in probability and stochastic processes, demonstrate their applicability to real-world problems, and introduce the basics of statistics. The book's clear writing style and homework problems make it ideal for the classroom or for self-study. 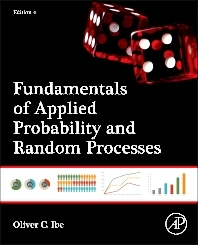 Provides new chapter on Introduction to Random Processes with 14 new illustrations and tables explaining key concepts. Includes two chapters devoted to the two branches of statistics, namely descriptive statistics (chapter 8) and inferential (or inductive) statistics (chapter 9). Dr Ibe has been teaching at U Mass since 2003. He also has more than 20 years of experience in the corporate world, most recently as Chief Technology Officer at Sineria Networks and Director of Network Architecture for Spike Broadband Corp.